Since I'm a writer/sicky-face, I don't work outside the home. Because of that, there are times during the day when I feel like I'm in pseudo-solitary confinement (the dogs count on some level, so I'm not completely alone) and that can make the hours seem very long sometimes. So, I usually find myself going out for lunch because, if nothing else, I'll get some semblance of human interaction. However, I'm not about to go to a sit-down restaurant by myself because it's weird and expensive to do often, and because I try hard to stay away from fast-food, it leaves me with only a few options. But, luckily for me, one of the options I have is pretty much the best place ever. Yeah, I love my standard veggie sub a lot but the real reason that I find myself getting in my car at 11:00 every day is because of the staff. Specifically, the weekday lunch-time staff (there are others who work there, and they're great too, but I don't really know them). As strange as it sounds, over the last year-and-a-half, the weekday lunch-time staff and I have kind of become friends. And you know why? Because they're all really friendly, funny, and seem to actually like their jobs (which is a rarity in food service, as we all know). There's Barb, who always has a smile on her face, a quip on her lips, and recently declared herself to be my favourite employee (she really is hilarious); April, a gal who's after my own heart with her brightly-coloured flower hair clips and appreciation for both a good joke and a fun manicure; Nate, a thoughtful and very considerate guy who takes great care in whatever he does; Shelley, an avid animal lover who never judges my request for "extra cheese wrapped up on the side for the boys" and, in fact, occasionally campaigns for them to get a "bacon upgrade" (which has secured her a spot in their hearts forever); and Kathy, who keeps the whole operation moving smoothly with her the ability to deal with a difficult customer with nothing but calmness and patience. They all know my order's eccentricities (lightly baked bread, extra cheese on both sides (when needed), no gross pickle ends, with southwest and house sauce on the side so it doesn't get soggy) and I always leave with not only a big smile but also a delicious sandwich, both of which help me get through the rest of my day. So, for being awesome at making sandwiches while also being awesome at life in general, I hereby award a bag of mad props to the staff at Subway's Prospect St. location, in Fredericton, NB. (Err...make sure that Barb gives you some of those, guys, because we all know how much she likes to hoard gifts ;) ). 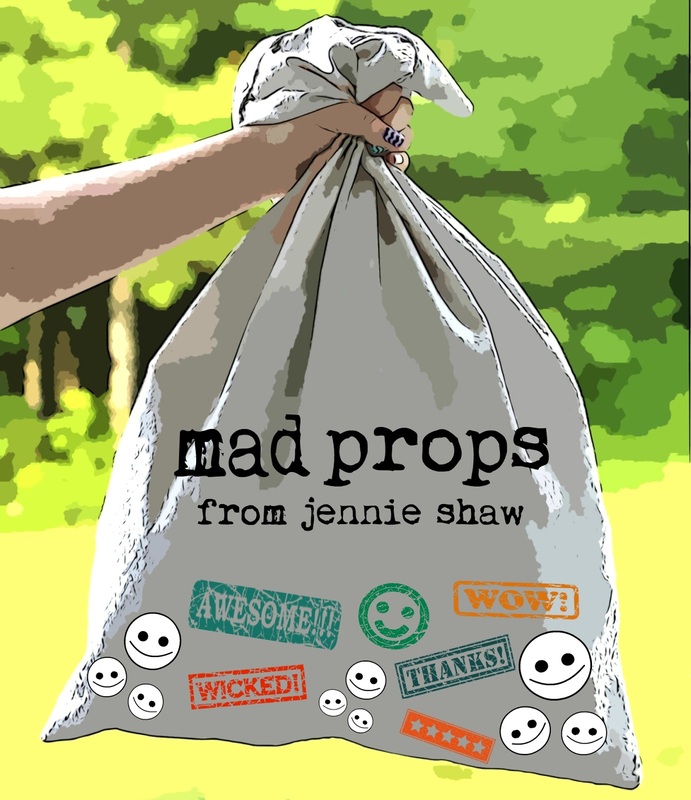 Do you have anyone you'd like to give a bag of mad props to? Shoot me an email with the details (found in the "contact me" tab) and we'll get to work prepping some! There's more than enough to go around so there's no need to be be stingy. Ha! That stuff makes such a big difference in your day. Pierce at my favorite coffee shop, West Bank Bistro, just lights up my morning (iced coffee) or afternoon (iced tea). Your Subway crew sounds like the perfect lunchtime pick me up! What a nice tribute to them!! Definitely post this on yelp or urbanspoon too so they can see it!! I work from home too but I don't usually leave all day while I'm working - which definitely makes me feel like a quarantined human. Sidebar - I definitely take myself out to breakfast and dinner sometimes alone. I've been doing it for years at this point so I don't even feel weird about it anymore!